High Power / mass ration tips and integrated heater / thermocouple delivers the best thermal recovery and lower soldering temperatures. JBC use one wire buried deep in the tip of the copper to “read & feed.” JBC's thermocouple and heating element are one in the same and are microprocessor driven over a sensor at 60 hertz (60x a second) utilizing up to 140 watt transformer. 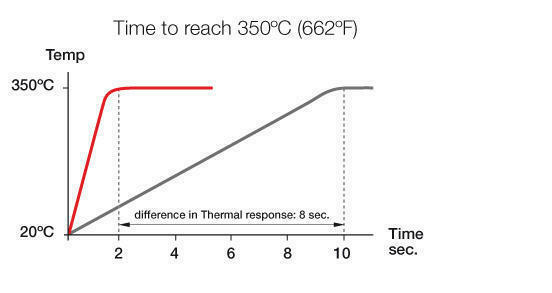 This is why our thermal performance cannot be matched. A conventional station takes between 10 to 90 seconds to reach 350° C. Any JBC station with a T210 hand piece reaches this temperature in only two seconds. 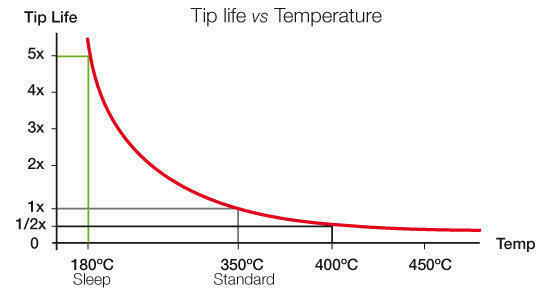 Lasting up to 5 times longer as soon as the soldering iron is left in the stand, the tip temperature automatically drops to 180°C, decreasing oxidation and wear. When the soldering iron is taken out of the stand again, the working temperature is instantaneously reached. 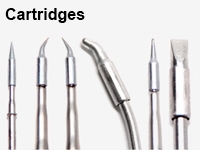 NOTE: It varies by tip geometry, temperature settings, solder, flux, and the operator ability. No tools needed to change the tip. Just place in holder, pull and insert the new tip. 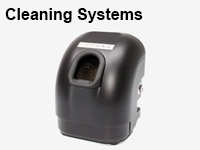 Reduces your idle time while increasing operator safety. 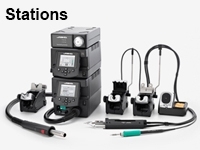 The JBC soldering irons are currently the lightest, smallest and most ergonomic handpiece available. Offering the shortest tip-to-grip distance and a higher working performance. Regain control of your process! Set temperatures limits, read counters, block the station with PIN or block the keypad. Extend tip life by reducing temperature and reduce energy usage to 10 watts during sleep and 4 watts when hibernating. Since JBC technology is microprocessor driven, it not necessary to recalibrate any of the JBC stations but, if required, calibration of the soldering tip can easily be done by using JBC's Thermometer and the temperature adjustment of the station’s menu. 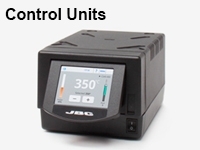 The JBC technology gives an 80% improvement over the performance of the best soldering station available in the market. The graph shows responsiveness of a standard station compared to a JBC station. 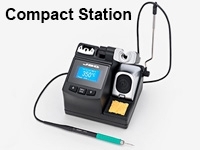 A standard station needs between 10 and 90 seconds to reach 350oC, while any JBC station equipped with a T210 handpiece reaches the same temperature in only 2 seconds. The superior responsiveness of the JBC system could not be clearer. 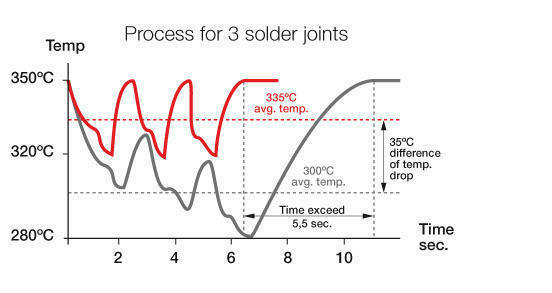 This graph shows the same tool, performing a series of 3 solder joints. Because of the lacking thermal response of the competing (grey) tool, the temperature drops 70° C compared to 30° C for the JBC tool. This difference gets bigger as the solder job gets more demanding. tip temperature to 180ºC when the iron is resting in the stand. 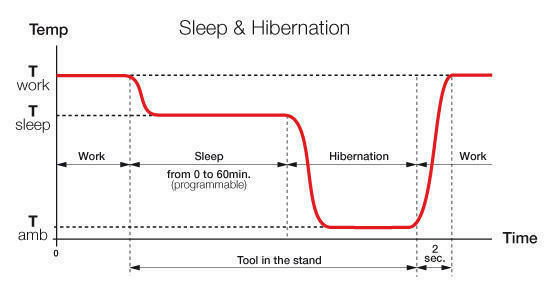 The station automatically goes into hibernation when the programmed time in Sleep mode is over. The power supply is cut off and tip keeps at room temperature. A stand is required to activate both functions. Tip life increases exponentially by using lower tempearture during less time, as shown in the graph. JBC tips last 5 times longer than other brands thanks to the Exclusive Heating System and the Intelligent Heat Management: Sleep & Hibernation functions.